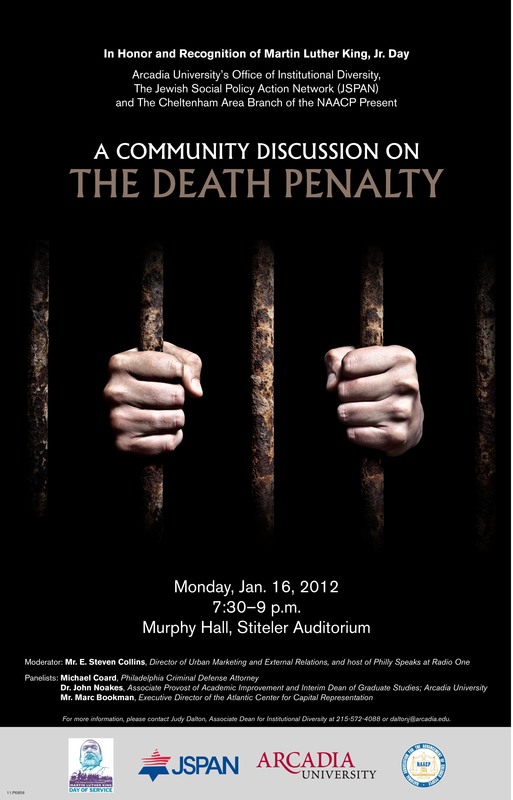 In honor of Martin Luther King Day, the Jewish Social Policy Action Network (JSPAN), Cheltenham Area Branch of the NAACP, and Arcadia University’s Office of Institutional Diversity present “A Community Discussion on the Death Penalty” on Monday, Jan. 16 from 7:30-9p.m. in Stiteler Auditorium, Murphy Hall, Arcadia University, Church and Easton Roads, Glenside PA.
Moderating the discussion is E. Steven Collins, Director of Urban Marketing and External Relations, and the host of Philly Speaks at Radio One. Michael Coard, a Philadelphia criminal defense attorney who specializes in murder cases. He is a founding member of Avenging the Ancestors Coalition, the president of the Philadelphia Millions More Movement, a state board member of the ACLU, and a founding member of Judging the Judges. Dr. John Noakes, Associate Provost of Academic Improvement and Interim Dean of Graduate Studies at Arcadia University and Associate Professor of Sociology and Criminal Justice, who is an expert onthe relationship between the state and political dissent. Marc Bookman, Executive Director of the Atlantic Center for Capital Representation, a non-profit death penalty resource center located in Philadelphia, Pennsylvania. ACCR provides pre-trial consultation to capital defense practitioners and defense teams in Pennsylvania and Delaware.